Being a hair extension technician for the past ten years, I have dreamed of having my own line of products. I began a search for a care line as I put so much emphasis on after care for hair extensions, and brought this to Issonni last year and after a lot of research and hard work I have finally recieved the first Issonni brand human hair product. 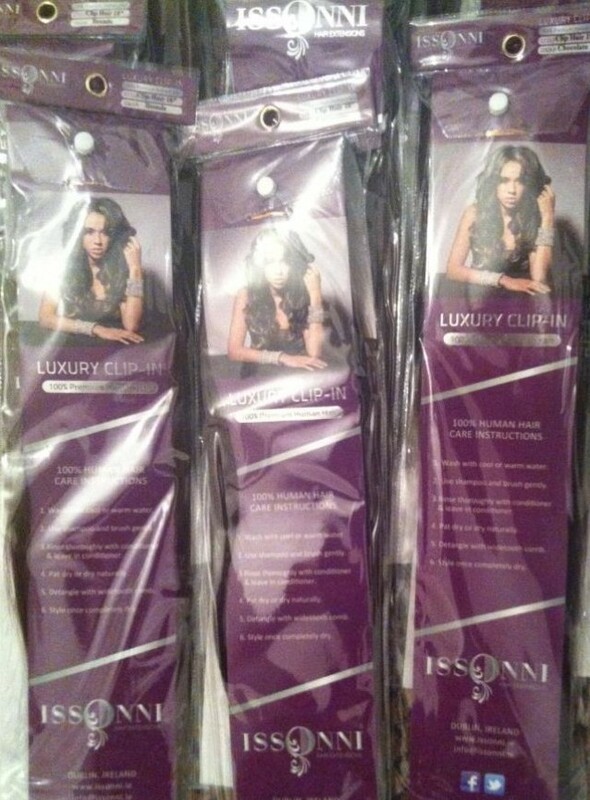 Issonni Luxury Clip-in hair is superior AAA grade human hair, they are 18inches in length and 125gms in weight excluding the clips. I hope that this product will grow legs and expand into a whole range of wonderful hair extension products. I meticulously researched where I would buy the product and am very pleased with the finished result. The full head clip in consists of three tracks of hair, and is available in fourteen hand blended colours. By blending the base colours with low lights and highlights I hope that Issonni has cinched the colour matching angle, as so many clients relayed to me that they could never get an exact match for their hair. Currently running an introductry offer of €110.00 (RRP: €125) until 31st October 2012. Not the best image of the product although professional shots are coming soon as the clip-ins will be available to buy online. If you would like to buy clip-ins please just give a call in advance so that a short time can be spent with you getting you the perfect colour match. Application and razoring of your clip-ins is also available at a cost of €45.